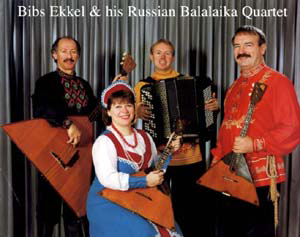 Balalaika Orchetsra, an ensemble of the much loved Russian instrument. Entertaining Russian folk music for TV, shows, concerts & events around the world. Bibs Ekkel, prima balalaika soloist, is one of the top masters of the instrument outside Russia. His style elevates the balalaika to the stature of concert instrument while retaining close ties with the instrument’s folk heritage. He has entertained Royalty as well as ordinary folk with his extensive repertoire in settings ranging from cabaret to symphony hall. 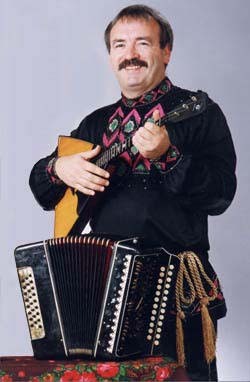 His song and dance company, “Tziganka”, as well as his folk group “Russian Tornado”, regularly tour and he has performed as soloist throughout the world – with TV appearances in Russia, Poland, China, Britain, the US and Canada. “Eastern Promises”; “The Man Who Knew Too Little”; HBO “Comrades Of Summer”; “Onegin”; “Riley, Ace Of Spies”; “Anna Karenina”; “Crime & Punishment”; Gulag”; “Englishman Abroad”; “Alice In Wonderland”; “Yasha The Liar”; “The Saint”; “Amie Foster (Swept From The Sea)”; “Last Night Another Dissident”; “Professional Foul”. Just what it says on the packet! Available in a variety of sizes, as are the balalaikas. The Balalaika is probably the most recognised and well-loved of Russian folk instruments and is seen by many to be the epitomy of the ‘Russian Soul’.